We resort to cookbooks for inspiration, out of admiration for a certain chef or cuisine, or simply to cook a specific dish. For kids, cookbooks offer even more than that! They feed their absorbent minds, raise their tolerance for certain foods, and teach them a huge range of new skills, such as measurements and fractions, and reading and communication skills. 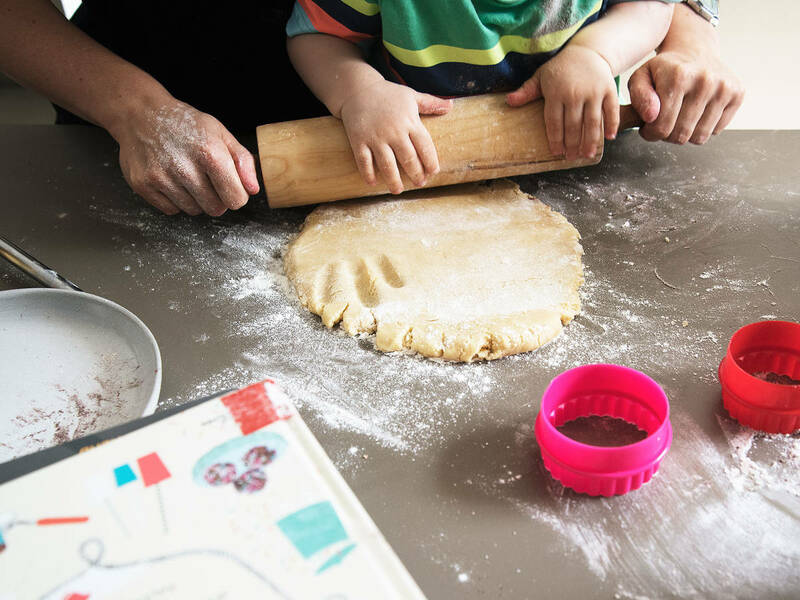 Cookbooks can also enable them to learn motor-skills like kneading, tearing, squishing, sprinkling and scooping, and not to forget social skills and positive emotional empowerment. Cooking a dish (almost) all by themselves will raise your kids’ self-esteem and excite them about sampling the food that they have created. Today, many kids’ cookbooks are fun, colorful, and full of experiments and storytelling. There is a huge selection available, yet not all of them allow your children to take center stage in the kitchen. We have selected a handful of books for all ages that will engage, inspire and empower your children to rule the kitchen with minimal adult intervention. Which cookbooks are on your children’s shelves at home? Is there a book that they absolutely love? Or one that you give away to friends’ kids frequently? Let us know in the comments below. The Tickle Fingers Toddler Cookbook: Hands-on Fun inthe Kitchen for 1 to 4s by Annabel Woolmer is one of the few aimed at the youngest chefs from one to four years old. It is all about keeping it simple and having fun with your kids in the kitchen. The book features 60 recipes that are healthy and age-appropriate with just a handful of ingredients and little sugar. It focuses on activities that toddlers love most, without the need of hobs, sharp knives or raw meat. At first sight, the book may appear quite text-heavy with somewhat uninspiring recipe photos but we love the clear structure of the book, and the simplicity of the recipes. The theoretical background tells you more about the benefits of cooking with kids, allergies, fussy eating, kitchen safety and everything else you need to know. It’s a truly empowering book for parents who have never cooked with their kids and don’t know how to go about it, or those who are looking for yet more ways to make the cooking experience educational, enjoyable and fun. Three levels from “easy peasy” to “confident chef” make it possible to use this book for smaller and older toddlers, although we’d recommend it for two to four year olds. The cooking process will need to be steered by the adults, but the book will keep the kids busy without a doubt and create results that both parents and kids will be proud off. The book was first published in the UK in 2016 and is now available for pre-order in the USA. Children between three and seven years will love Mollie Katzen and Ann L. Henderson’s book Pretend Soup and Other RealRecipes: A Cookbook for Preschoolers and Up (published in 1994). The nicely illustrated book breaks down each of its 19 recipes into two pages of drawn steps and simple word instructions that are easy to follow for the young budding chefs without much adult interference. In addition, each recipe is also available as an adult version with useful tips for grown-ups, plus funny reviews by a panel of children. The book also features a range of cute watercolor creatures, although there aren’t any recipe photos that show you the intended result. Most of the recipes are very simple with just a handful of ingredients, yet sometimes a bit odd, featuring strange flavor combinations like egg noodles, cottage cheese and cinnamon. All recipes have been extensively tested by the preschoolers, and their voices echo through each page in a charming and entertaining manner. Overall, “Pretend Soup” is a very thoughtfully written, timeless and charming book that takes cooking to a child’s level. A brilliantly original and visually gorgeous book that is aimed at five to 12-year-old kids is Kinder, an den Herd! : Wir kochen,experimentieren und staunen (2015). Unfortunately, it is currently only available in German but we think it deserves to become a bestseller around the world. The roughly 70 recipes are divided into creative chapters such as fairytale kitchen, spontaneous pantry raid, and lets-play-restaurant with full menus to challenge budding chefs. We love the kitchen experiments throughout the book that will enable children to experience science in their home kitchen. There are a range of fun activities and clever food facts in order to shed light on questions like “why does popcorn pop“ or “why do apples turn brown“. The majority of recipes are nutritious, simple and original. Some recipes are heavier on words and ingredients than those in other kids’ cookbooks, so we would suggest this book it best for nine to 12 year olds. Grown-ups will appreciate the visual detail, stunning photographs, graphic elements and its vintage flair just as much as their kids. This book will truly inspire kids to explore, experiment and experience food and cooking in a new and innovative way. You may know the bible of Italian cooking, The Silver Spoon, but did you know that there is also a kids’ version available called The Silver Spoonfor Children: Favorite Italian Recipes (2009)? It’s an adaptation for nine to 12 year olds, and if you have sampled some of the Silver Spoon’s 2000 recipes, you may be disappointed by the simplicity of the kids’ version’s 40 recipes. Most of them are the stereotypically Italian dishes that you would expect like pizza Margherita, bruschetta, focaccia, lasagna or risotto. For culinary interested children, this book offers a great introduction to Italian cuisine with recipes that are guaranteed to please young taste buds. We adore the book’s step-by-step illustrations and bright colors, the straightforward layout and color photographs of the finished dishes. For kids who are fed up of funny food faces and silly kids’ garnishing, this cookbook offers a more grown-up take on cooking whilst instilling an appreciation of culinary Italy. A book that we find fantastic for young adults with an interest in cooking and a love for animals and the environment is Cookin' Up a Storm:Sea Stories and Vegan Recipes from Sea Shepherd's Anti-Whaling Campaigns (2015) by Laura Dakin. Laura’s story itself is fascinating, as she joined the Sea Shepherd marine conservation organization at the tender age of 21 to feed a hungry crew of 50. The book is full of adventures from the sea and personal anecdotes from the eco-warriors, all of whom maintain a plant-based diet. The recipes are very delicious and original, yet simple enough to achieve success. Great photographs of life on and in the oceans make up for the lack of recipe pictures. The measurements are only in cups, which may be a challenge for some who prefer to cook with metric measurements. But we have fallen in love with this book for its great storytelling and its extensive collection of yummy vegan recipes, whilst sharing a heart-felt mission about environmental conservation.